The parents, two brothers and two sisters, of the famous writer and humorist, Mark Twain, were once residents of Jamestown, Tennessee, and lived there just shortly before he was born. During the year 1952, the history class of Livingston Academy, along with their teacher, Kenneth R. Stephens, who later became principal of LA, spent a year compiling information for a book entitled Echoes From The Foothills. The book contains historic information put together from interviews the students did with older citizens of Overton County along with relatives of class members. It was reprinted in 2002 by the Overton County Heritage Museum. Charles Maynord loaned me his copy from which my journal entry comes this week. Kenneth Winningham; Billie Dean Wright; Inez Wright; John K. Wright. The book prepared by this class is filled with much information that might have been lost forever had it not been for their hard work. I was especially interested in the fact that Christine Beaty’s contribution to the book revealed some very interesting facts that I was not aware of. 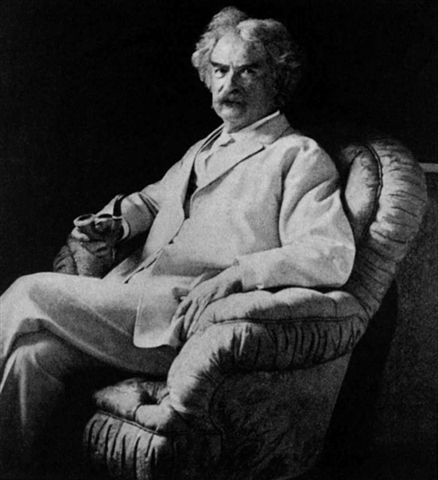 One of America’s greatest icons, who was also a printer and journalist, a steamboat pilot, a gold and silver miner, a newspaper editor, author, and publisher, none other than the famous Mark Twain, (real name Samuel Langhorne Clemens) is a person Tennessee can partially claim as one of the outstanding men of this region. Even though Samuel Langhorne Clemens’ actual birthplace is Florida, Missouri, his parents lived and owned a vast amount of property in this area just shortly before he was born. John Marshall Clemens, a lawyer, who was Mark Twain’s father, settled with Jane Lampton Clements, his young bride of one year, in the town of Gainesboro, Tennessee. In 1825, while still living in Gainesboro, their first child, a boy, whom they named Orion, after the constellation perhaps, was born. By the year 1827, the Clemens had moved to Jamestown, Tennessee, where a second child, Pamela, was born in September of that year. Three years later, another daughter, Margaret, was born. The town of Jamestown was brand new at the time the Clemens family moved there, and it was John Clemens’ belief that it would become the metropolis of East Tennessee. He took an immediate and active interest in the development of the place, established the county-seat there, built the first courthouse and jail, and was promptly elected as circuit clerk of the court. It was then he decided to lay the foundation of a fortune for himself and his children by acquiring land. Grants could be obtained in those days at the expense of less than a cent an acre, and John Clemens believed that the years lay not far distant when the value of property would increase perhaps a hundred thousandfold. The land he bought was covered with the finest primeval timber, filled with precious minerals, and could hardly fail to become worth millions, even though his entire purchase of 75,000 acres probably did not cost him more than $500.00. It was later thought that possibly the acreage totaled to around 100,000 acres. A large tract of the property lay about twenty miles south of Jamestown. Standing in the door of the courthouse he had built, looking out over the knob of the Cumberland Mountains toward his vast possession, John Clemens said, "Whatever befalls me now, my heirs are secure. I may not live to see these acres turn into silver and gold, but my children will." Believing the future provided for, Clemens turned his attention to present needs. He built his family a house, unusual in its style and elegance. It had two windows in each room, and its walls were covered with plaster, something which no one in Jamestown had ever seen before. He was regarded as an aristocrat. He wore a swallow-tail coat ornamented with brass buttons, the material for which cost $1.25 per yard, an extremely high price for that locality and time. His wife wore a calico dress for company, while the neighbor wives’ dresses were homespun. The new Clemens’ home in Jamestown was referred to as the Crystal Palace. When John and Jane Clemens attended any of the numerous balls that were always held during the holidays, they were considered the most graceful dancers. But as it turned out, Jamestown did not become the metropolis John Clemens had dreamed. After the construction almost immediately of twenty-five houses, mainly log homes, the growth stopped there. Because the country was sparsely settled which required circuit riding from court to court which was very bad for his physique, John Clemens began to see his reserve of funds dwindle as well as his health begin to deteriorate . It was at this point he embarked in merchandise. He built himself a store and put in a small stock of goods which he exchanged for ginseng, chestnuts, turpentine, rosin and other produce of the country which he took to Louisville, Kentucky every spring and fall in six-horse wagons. After the birth of their daughter, Margaret, the store and home were in one building, the store occupying one room, the household requiring two. Clearly the family fortunes were declining. About a year after little Margaret was born, John Clemens moved his family and the wares in the store from Jamestown to an area nine miles away on the Wolf River known as Three Forks of the Wolf. He considered the Tennessee land safe, and of course, thought it would be worth millions someday, but in the mean time, the struggle for daily sustenance was becoming hard. The Clemens family did not remain long at the Three Forks, and in 1832, they were living on the right bank of the Wolf River where a post office called Pall Mall was established with John Clemens serving as Postmaster. A store was run in connection with the post office. In June, 1832, another son, Benjamin, was born. The family occupied a log house built by John Clemens himself, while the store was in another long house on the opposite bank of the river. By this time, he no longer practiced law. During these years, the bright promise of wealth in the Jamestown area had just about dwindled away. It was at this disheartening time that a letter arrived from the husband of Jane Clemens’ sister, Patsy, John A. Quarles. The letter encouraged John and Jane Clemens to give up the East Tennessee venture and join them in a new and more promising land in Florida, Missouri. There were only 21 houses in that settlement at the time John Quarles wrote the letter, but in his count, which included out buildings and stables, anything that had a roof on it, he set down the number at 54. The letter ends with the words "Come! Rush! Hurry! Don’t wait for anything!" The Clemens family were sold on the idea right away, and began immediately to prepare to move. The store and farm were sold and the last two wagon loads of produce were sent to Louisville. With the aid of the money received from all these transactions, they started their journey to Missouri. They traveled in a type of wagon called a barouche which is described as being a four-wheeled carriage with a folding top, that has an outside seat for the driver and facing inside seats for two couples. There were two extras horses which Orion, now ten, and Jennie, the house girl and slave, rode. This was early spring in 1835. John Quarles was already established in merchandise in Florida, Missouri, and offered John Clemens a partnership in his store. He agreed to aid him in the selection of some land, and also encouraged him to renew his practice of law. In a small frame building near the center of the village, John and Jane Clemens established their household. It was a humble one-story affair with two main rooms and a lean-to kitchen. It was in that home that the foremost American born author, the man most characteristically American in every thought, word, and action of his life drew his first fluttering breath. John and Jane Clemens were still residing in Fentress County only five months and twelve days prior to the birth of their sixth child, Samuel Langhorne Clemens. In some of the research I did, I found that there are those who believe that a person’s age should be reckoned from the moment of conception, which would make the mortal existence of Mark Twain as having begun in Jamestown, Tennessee. It should be noted that Halley’s comet was visible from earth in the year Mark Twain was born, that being 1835, and that same comet was again visible the year he died in 1910. In Mark Twain’s autobiography, he tells what happened to his father’s investment in the property in Fentress County. He says, "The vast plot of Tennessee was held by my father twenty years in tact. When he died in 1847, we began to manage it ourselves. Forty years after, we had managed it all away except 10,000 acres and got nothing to remember the sale by. About 1887, the 10,000 acres went. My brother found a chance to trade it for $250.00." Today in Jamestown, there is a Mark Twain inn and restaurant, a Mark Twain post of the American Legion, and the old spring near the courthouse square where John Clemens got his water, and the log cabin where he lived, is preserved as the Mark Twain Park. Although I have been aware of the business and little park in Jamestown that bear his name, I had never even stopped to consider the reason why. It was because of the information Christine Beaty included in the Echoes From The Foothills book that prompted my interest in gathering additional information to what she provided for the class publication. I inquired of some class members and others who I thought might have information regarding the whereabouts of Christine Beaty, only to find out that she has passed away. I have to wonder, did the fact the Clemens family moved from this area have any bearing on the path their son Samuel Langhorne Clemens traveled and the many accomplishments he achieved, or would his surroundings here influenced him to travel in another direction with his life. But one thing is for sure, had the letter from John Quarles to John and Jane Clemens arrived some six months later than it actually did, the town of Jamestown could definitely have claimed someone many consider America’s greatest writer and humorist. Learning about Mark Twain’s family and the fact that they once lived in this area was very interesting and something I thoroughly enjoyed researching and preparing for my journal entry.